Yeah, its dated. But the book continues to sell and spawn ancillary “products”. Maybe a look back is worth it. Besides, it was still in my files. Waste not, want not! It raises some of the perennial problems we have in Evangelicalism both in terms of superstitious approaches to Christianinty, as well as prayer itself. Hopefully, I’ll blog on both sometime in the relatively near future. But for now – Heeeeer’s Bruce! would keep me from harm that it may not pain me!” And God granted him what he requested. If you haven’t been exposed to it yet – you will. 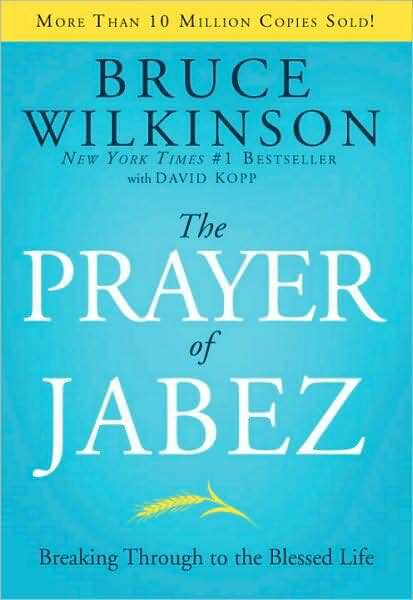 The Prayer of Jabez, a book by Dr. Bruce Wilkinson is all the rage in evangelical churches right now. A small and easily readable volume, Dr. Wilkinson says in his preface to it: “I want to teach you how to pray a daring prayer that God always blesses…I believe it contains the key to a life of extraordinary favor with God.” Sadly, it is from this point on that we must read with great caution. While I have not a single doubt as to Dr. Wilkinson’s great sincerity and love for Christ, nor his zeal for Believers, unfortunately his fictionalized approach to the life of Jabez, and the superstitious manner in which he encourages his readers to pray the prayer of Jabez like some form of Christian charm is deeply disturbing. Perhaps its greatest error rests in the fact that it paints a picture of a God who is not sovereign in His universe, but one who is frustratingly waiting for you and me to untie His hands in order that He might act. As we read on page 29 – “God’s bounty is limited only by us, not by His resources, power, or willingness to give.” Or on page 48 that “we release God’s power to accomplish His will and bring Him glory through all those seeming impossibilities.” Or worse yet, page 77 where Dr. Wilkinson imagines what God might say to him if he had not entered upon this Prayer of Jabez course – “Let me show you what I wanted for you and tried repeatedly to accomplish through you…but you wouldn’t let me.” Beloved, such statements are simply the product of a low view or poor understanding of the sovereignty of God and how He acts within His universe. It makes much of man and his will, and little of God and His will. That is always the beginning of great error. Spurgeon once wrote: “Depend upon it, there are countless holy influences which flow from the habitual maintenance of great thought of God, as there are incalculable mischiefs which flow from our small thoughts of Him. The root of false theology is belittling God; and the essence of true divinity is greatening God, magnifying Him, and enlarging our conceptions of His majesty and glory to the utmost degree.” This is true! The moment we leave this reality and trade the omniscient, omnipresent, omnipotent God of the Bible for one who timidly and impotently stands in the shadows hoping that somehow His fallen creatures will empower Him to act – we have made man god, and God less than man. Now I must repeat, that I do not for one second think that Dr. Wilkinson has done so intentionally � but nonetheless, very errantly. And it is this dear one which we must guard our hearts against. The picture painted for us in this book, is far different than the one given in God’s book. Where is the God of Daniel 4:35 of whom we read – “All the inhabitants of the earth are accounted as nothing, But He does according to His will in the host of heaven And among the inhabitants of earth; And no one can ward off His hand Or say to Him, ‘What have You done?”? Or the God of Isaiah 46:10 who is “Declaring the end from the beginning, And from ancient times things which have not been done, Saying, ‘My purpose will be established, And I will accomplish all My good pleasure”? This is the God we serve. This is the One whom we can rest the surety of our soul’s salvation upon, for He not only can, but DOES act in spite of and contrary to us every day in order to bring about the fullness of His good will toward us. Now we must be clear here: It is right to ask God to bless us – we are to look to Him in everything. It is right to ask God to be useful in His Kingdom and to bless our efforts to obey. It is right to depend upon the power of God in all things. It is right to ask God to be kept from evil. The danger comes when we superstitiously adopt something like this excellent prayer – as though just repeating it (as we are counseled to do in the book � along with several other steps for 30 days) will magically make things happen. This is little more than a Christianized form of white magic, albeit most innocently enjoined, I’m sure. But think about it for one moment – If Jesus’ teaching on prayer (not to mention we are not using the prayer HE taught us to pray) was that we are to avoid vain repetitions as the heathen pray – how do we then, in the name of Christ, enter upon that very course? Please � do not get me wrong. God indeed answers prayer. But it is not due to the fact that we pray a specific prayer, nor because of how often or how long we might pray it – but because He is our Father and promises to hear us! Period. The heart of any Believer yielded up in seeking His face is met with God’s abundant graciousness, whether you even know if the prayer of Jabez exists or not. In all seriousness, if this prayer of Jabez were in fact “the key to a life of extraordinary favor with God” � we are left with two insurmountable problems. First, apparently Jesus was unaware that we needed this prayer, for we have no record that He ever prayed it, ever taught anyone else to pray it, nor even mentioned it. Isn’t it odd that Christ Himself never mentioned “the key”? Nor is it ever mentioned in any of the New Testament writings. Odd. Secondly, it flies in the face of the fact that our favor with the Father is to be rooted in that we are “in Christ.” (Eph 1:6 To the praise of the glory of his grace, wherein he hath made us accepted in the beloved.) If we are looking for keys to the Christian life, maybe we would be better off not worrying so much about trying to find some measure of extraordinary favor which we already have in Christ, and spend more time following things like those Jesus mentions in Matt. 16:24 “Then Jesus said to His disciples, “If anyone wishes to come after Me, he must deny himself, and take up his cross and follow Me.” There’s the Christian life – following Him.